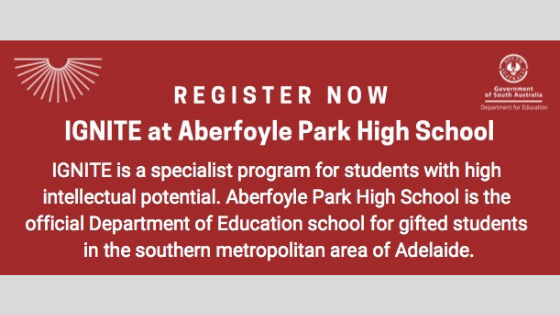 Aberfoyle Park High School is the official Department of Education school for gifted students in the southern metropolitan area of Adelaide. Our IGNITE program is specifically designed to meet the needs of students with high intellectual potential. Initial selection for the program is based on the student’s performance in the Australian Council for Education (ACER) Gifted and Talented Assessment. All current Year 7 students are eligible to sit the test for a place in the IGNITE program for 2020.